This Northern Point residence is situated in Round Pond in the town of Bristol. 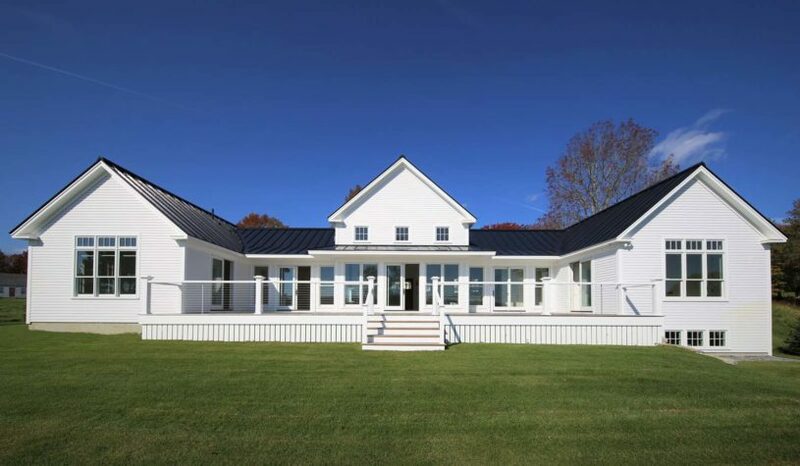 It is a striking example of new construction built in classic New England style with simple lines and familiar finishes executed in unique ways. The building is perched on a rolling field, a picturesque piece of land that was one of the last developable parcels on the harbor. The siting of the house allows distant views of it as one travels toward it along Northern Point Road from the village center. The first glimpse of the house is across a field looking east. The harbor and Louds Island beyond are an exquisite backdrop as you orbit the house on the approach. The house is nestled in a slight hollow that makes it seem modest and allows it to fit in with the historic structures it neighbors. At final approach, one descends the driveway to a courtyard parking area that mimics the courtyard of an old English manor. The space is bound by the carriage house and a dramatic colonnade on one side and by the field and stone-mending wall on the other side. They are organized in a procession that leads to the main facade and covered porch as a final destination, at which point a pair of eight-foot-tall mahogany doors allow entry into the interior. This single-story house is a simple tripartite concept with two flanking “private” wings connected by a main living area. The layout is that of an open-concept room, with vaulted ceilings and an extensive assortment of windows and gliding doors that flood the space with light. An expansive outside deck in the middle connects the parts together and capitalizes on the gorgeous setting along the water. This house was built to replace a shore-hugging childhood camp. The structure was designed to optimize the rebuild and to expand 30 percent within the setback. 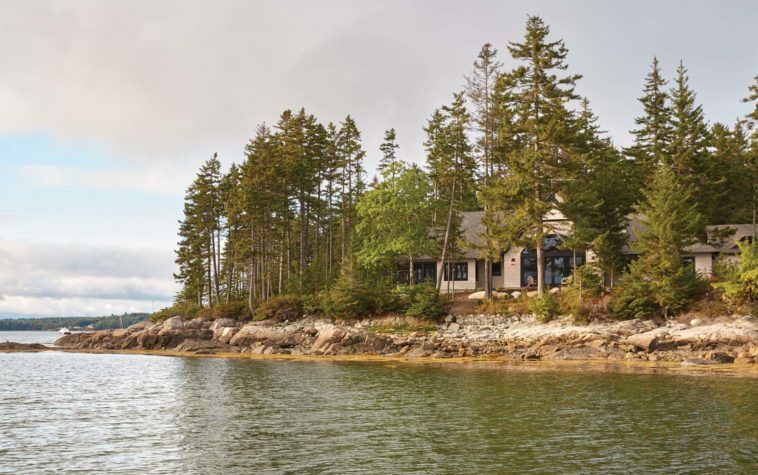 The home enjoys a captivating 270-degree view of Frenchman Bay, with Mount Desert Island silhouetted behind a series of closer islands, peninsulas, and a charming assortment of boats. Even though the new structure is larger than the original, great care was taken to ensure it fits harmo- niously with the land. 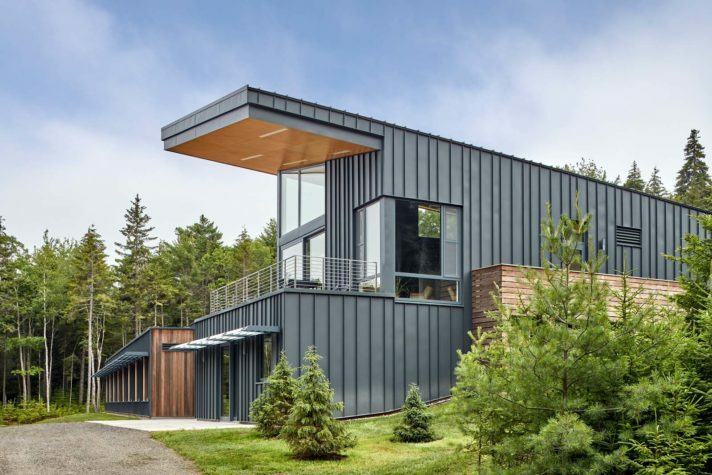 The low profile of the massing and the natural siding material allow the building to blend into its meticulously pre-served surrounding vegetation. Part of a family compound, this home was intended to provide a year-round getaway for the owners in proximity to their family. Composed of a series of warm and cozy rooms and characterized by varying patterns of wood walls in a tonal array of nature-inspired colors, the home possesses a welcoming scale and an intimate feel. On the ground floor, which seeps outward through expansive doors, over organically dissipating stone patios, and into the natural ground cov- er and woods, there is a gracious owners’ suite, a comfortable living area, a large eat-in kitchen, and his-and-hers offices. The primary rooms are rendered airy by generous windows and wood-planked cathedral ceilings. A partial second floor adds flexibility, with rooms for art and exercise and open spaces for lounging that peek over the living room and into the kitchen below. A comfortable screened porch and a single-bay garage with a small studio above it round out this home’s functionality. 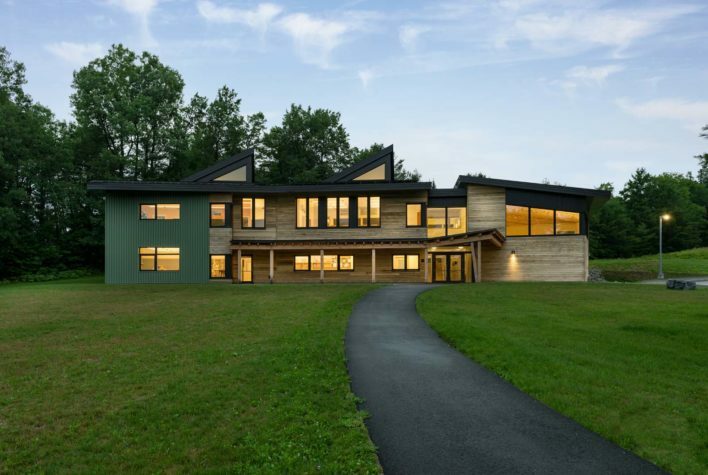 The Maine Coast Waldorf School requested a building that would foster creativity, inspire curiosity, demonstrate environmental stewardship, and honor the spirit of its occupants. 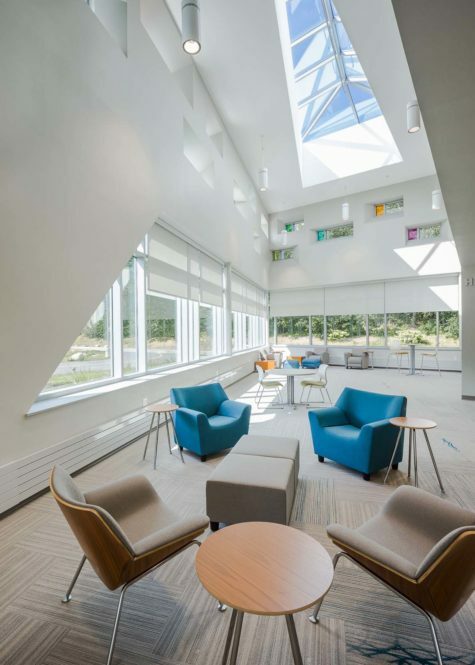 Located on a pastoral property consisting of more than 70 acres in Freeport, the new high school building completes the campus by bringing together students from grades kindergarten to 12. The building is intended to be a living lesson for students, becoming a baseline for the future that they are destined to inherit. An emphasis on natural materials and day lighting strategies offset the need for artificial illumination and maintain a constant connection between the building’s interior and its natural context. 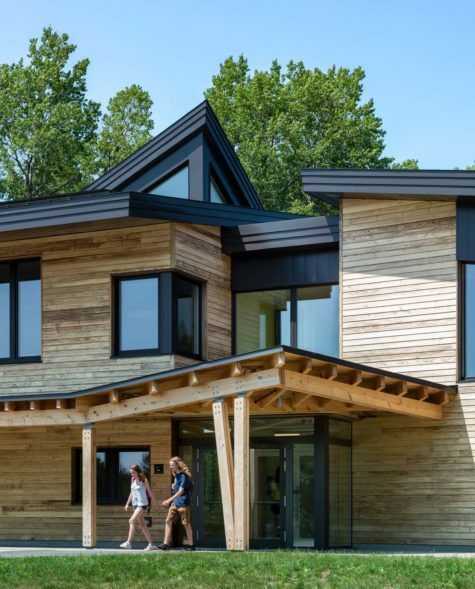 Students are taught about the building’s systems and about incorporating passive house principles to provide a healthy, energy-efficient space that responds to necessary global environmental priorities. By also achieving Maine Advanced Building Tier Two, Maine Coast Waldorf received a cash incentive for reaching stretch performance gowls, thereby helping to fund the push to full passive house certification. To achieve this, the building envelope boasts roofs of R-55, R-70.5, and R-82; typical walls are R-51.6 and R-61.5 to the north; the structure came together through an R-17.8 slab assembly; and openings feature triple-glazed Intus windows and Reynaers doors. Mechanical systems are composed of three RenewAir energy-recovery ventilators and a Mitsubishi MXZ heat pump, with additional fault and error detection systems in place to ensure ongoing system performance. A close, cohesive project team was a key component of the project’s success. The builders were frequently treated to songs the students composed to ac- knowledge the collective achievement and their deep gratitude for the effort. One cannot help noting that this building stands to make lasting impressions on the lives of thousands. 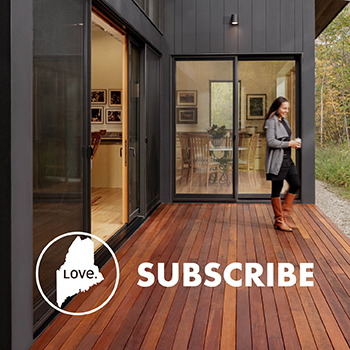 This new modern farmhouse designed for a couple from Alaska sits on an expansive pastural landscape in southern Maine. The property is accessed by a long, winding driveway through the forest that culminates at the heart of the property with a 200-degree open vista facing south. The owners wanted a house that would stretch easily onto the site and encouraged views over the family property from a variety of angles. After considerable site analysis, Delano Architecture organized the house in a broken U shape and inserted the entrance into the protected courtyard, organized major living spaces linearly along the south, and placed the kitchen and dining areas eastward to take advantage of the morning sun. Each major element faces a different sunlit view of the property throughout the day. The house has two owners’ suites: one located by itself on the second floor and the other located on the first level, remote from the second. This provides optimal flexibility for the owners and any guests (temporary or permanent) that they may have in the future. On the exterior, two linear decks extend away from the house like piers to the east and to the west. The decks slide out from the central living space and provide the occupants with an exposed vantage point to enjoy dominion over their property. The owner is a skilled local contractor and carpenter who spent nearly a year building all aspects of the house with his wife and his crew. This contemporary Maine camp is situated on the edge of Sebago Lake at the end of a long peninsula. The house, a blend of traditional shapes and contemporary details, was envisioned as a kind of dock extension connecting the land to the lake. From the entry, a series of connected steps, decks, and stone walls help define the relationship of the house to the land and the lake. The house is composed of two separate but distinct volumes connected by a porch that provides opportunities to sit outside along its entire length. At one end, the porch is screened in. 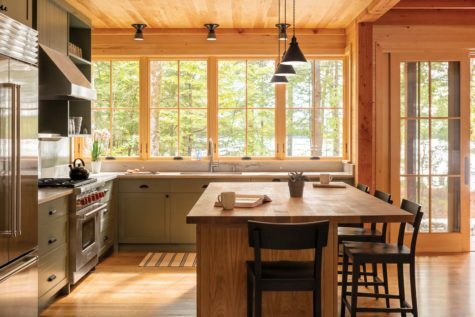 The continuous porch connects the high-volume, very transparent, and more public living, dining, and kitchen wing to the more opaque, private bedroom wing, which gives the entire house the look and feel of a traditional Maine camp compound. A double-sided Rumford fireplace constructed with the same stone used for the exterior stone walls and steps divides the living room and the screen porch. All the elements of an old camp are here, but applied in a more open, light, and casual plan that is as much about living outdoors as it is about living indoors. 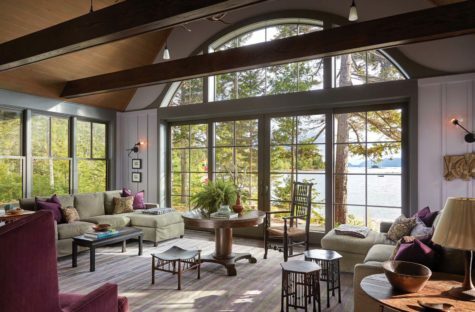 A stainless-steel truss system adds to this lightness in the high-ceilinged living space, while the overall natural palette of mahogany, ipê, green metal roofing, and cedar shingles blends well with the surrounding landscape. When the clients bought the property several years ago, there was a waterside deck with a magnificent view of Penobscot Bay on a bluff in front of a dark, old, uninsulated camp. On the land side, the grade dropped sharply to the front door and exposed a crowded ledge on one end. The camp’s bayside wall skirted the 75-foot shoreland setback line, and the entire deck was within 75 feet of the shoreline at the bottom of the steep and rocky face. The clients wanted a new year-round retirement home within a limited budget. Rebuilding the deck and taking advantage of the spectacular vista were the driving forces for the design. One room deep, the new house has windows on two sides of every living space. On the entry side, away from the water, are bathrooms, closets, and utility rooms. In the main room, an open office alcove sits against the hillside wall, with a sheltered view to the woods and a sight line beyond the living room fireplace to the water. The front wall of the great room runs along the front of the original camp with the owners’ bedroom wing set six feet back. This gives the owners’ bedroom a private deck and the living room an expanded view. On the opposite side of the main room, the guest bedroom wing is set 12 feet back, creating an open, light-filled dining area. The two guest bedrooms are at a higher floor level to avoid the ledge and make this wing more private. The house is sheltered on the land side by the hill, the woods, and a large, covered entry. 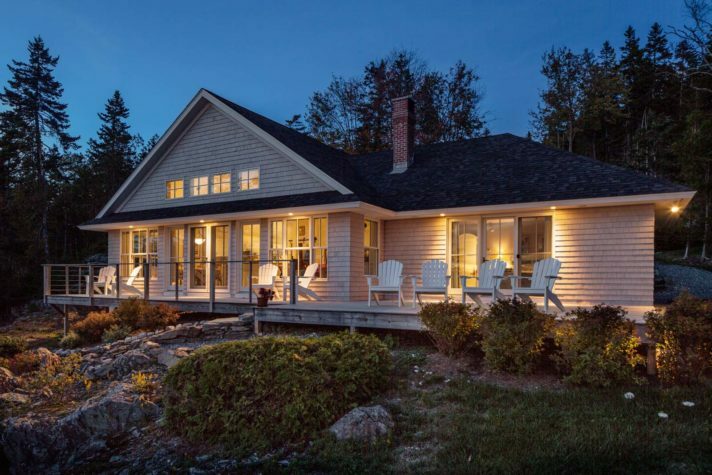 On the water side, and from every room, the house is open to the large expanse of Penobscot Bay. 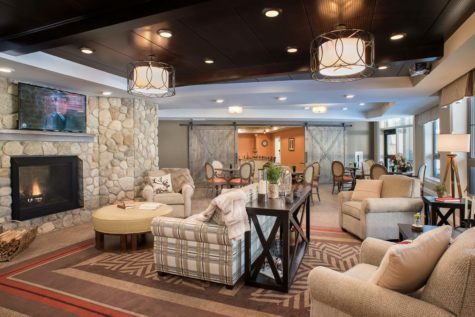 Inspired by its surrounding woodland landscape, Stroudwater Lodge is a 95,000-square-foot, 95-unity full service vice independent and assisted living community for seniors. Its residents experience state-of-the-art living and innovative technologies that facilitate lifelong learning, activity, and enjoyment. Situated on a 65-acre wooded campus on the outskirts of Portland, residents thrive in a peaceful setting while having easy access to the hubbub of downtown. The core design challenge was to meet the owner’s mission: to “create living environments and innovative programs that encourage freedom, offer lifestyle choices, and provide the necessary services to live life to the fullest.” The design provides individual choices across the board, for both residents and their families. Living options include private studios and one- and two-bedroom apartments with kitchens and patios or balconies. Indoor amenities include a hair salon, a comfortable theater, a brain gym, and a physical exercise gym. For dining, residents choose between an array of beautifully finished venues including the main dining room, an eat-in tavern, a gourmet kitchen/classroom, a private dining room for intimate gatherings, and a bistro/cafe; all are centered around a fully equipped commercial kitchen. Stroudwater’s timber-frame lodge is cozy and intimate with a comfortable Maine aesthetic. Residents connect with the surrounding environment via wood- land walking paths, private patios/balconies, a communal patio with fire pit, and a relaxed, four-season screened porch. 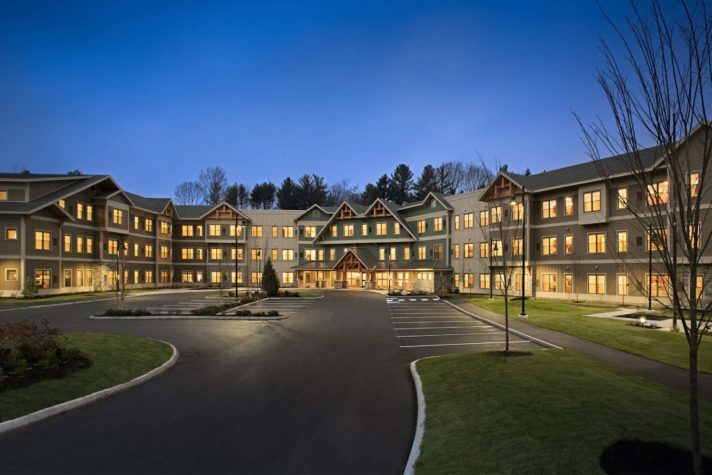 One major technical challenge was a state of Maine code that requires different building construction types for independent and assisted living programs; Gawron Turgeon designed a noncombustible building to allow intermixing of independent and assisted living units, enabling residents to age in place if they require assisted care later in life. Senior-specific design details throughout the campus provide comfort, accessibility, wayfinding, and safety. 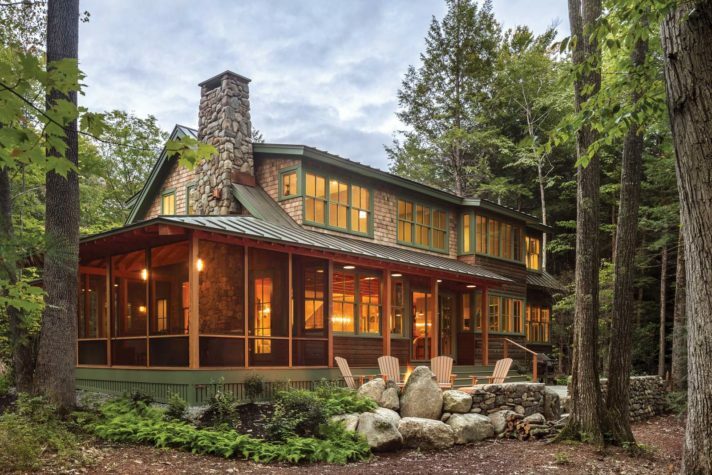 This home is nestled on six acres of naturally forested land on the coast of Maine. George Penniman Architects preserved as much of the natural site as possible, with minimal clearing and helical piles in lieu of a traditional concrete foundation. An elevated boardwalk crosses a restored wet- land to connect a parking area to the front porch. 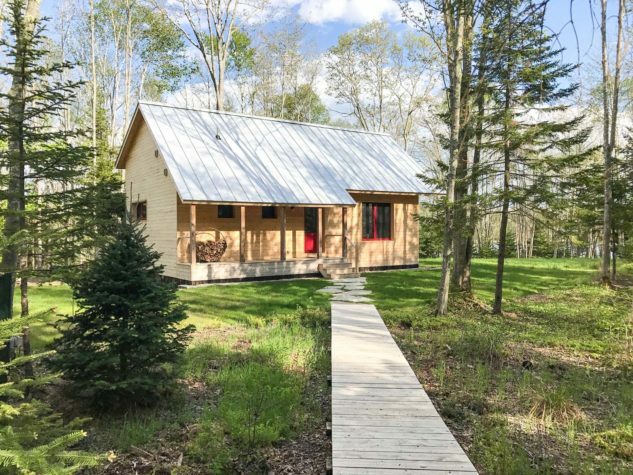 The cabin’s floor and wall assemblies were panelized and premanufactured off-site, while the truss roof, porches, and finish work were conventionally built. The airtight construction, full-depth cavity insulation, triple-pane windows, and heat-recovery ventilator keep the interior temperature at a constant 68 degrees with a little help from a mini-split heat pump. The direct-vent woodstove is purely for ambiance and the owner’s love of a crackling fire. 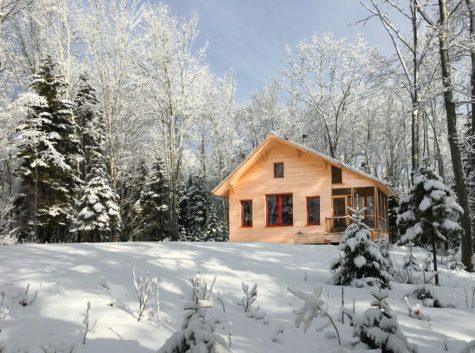 With its simple form clad in natural wood, the home resembles a traditional rustic cabin in the woods, but its passive house construction eliminates qualities of other conventionally built homes, such as drafty rooms, temperature swings, and high energy bills. Maine products and materials were used throughout the project. Exterior white cedar siding and decking, interior ash floors, and pine walls were sourced from Maine woods. 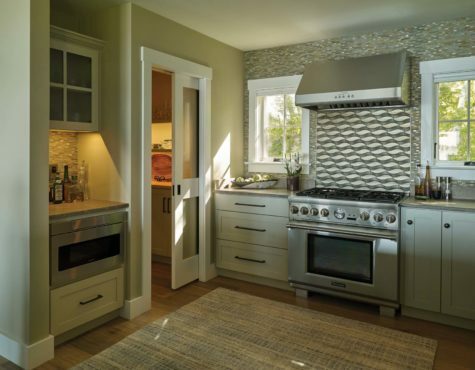 The granite floor tile, the hearth, and the kitchen backsplash are Englishman’s Bay granite. A red birch bench in the entry vestibule was built from a sunken log reclaimed from Moosehead Lake. This is a simple, high-performance cabin designed to be snug in the coldest winters and to enhance the joys of outdoor living in the summer. The first high-performance institutional building in Belfast, the Cornerspring Montessori School’s new facility represents a milestone for both the school and the city. 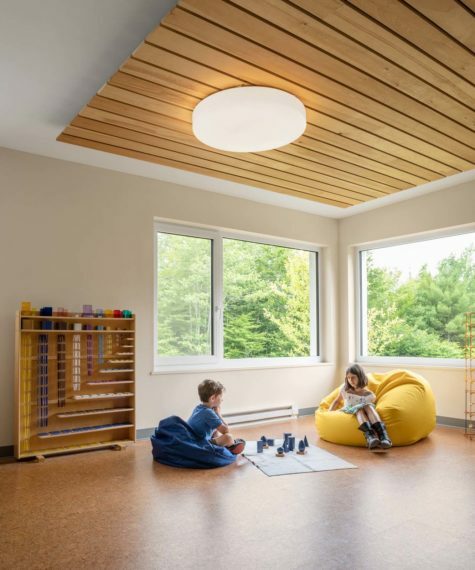 Combining a bold contemporary form with subtle vernacular references, the building supports Montessori pedagogy while following the stringent passive house model of energy efficiency and indoor air quality. The result is an inspiring learning environment that achieves the highest levels of comfort, health, efficiency, and durability. Classrooms and a flexible common space line the building’s north side, with large windows that deliver ample day- light. 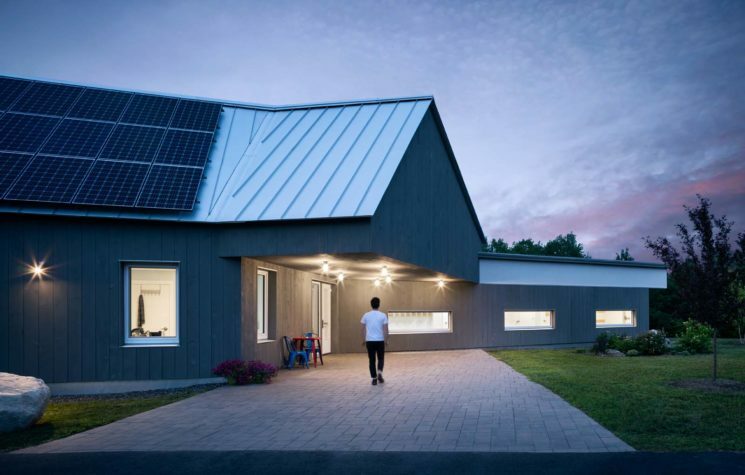 Circulation spaces, administrative functions, and the toddler room occupy a smaller volume at the south beneath a barnlike pitched roof that supports a 16-kilowatt photovoltaic array. In a contemporary nod to the archetypal rural schoolhouse, a dramatically cantilevered gable announces the main entrance. 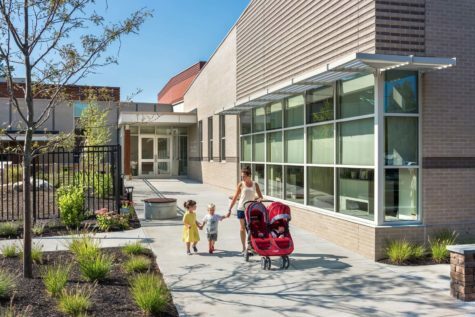 The building’s design is deeply in- formed by Montessori educational philosophy, which emphasizes independent learning, outdoor activity, and interaction among age groups. Each classroom is a sunny, flexible, self-contained learning environment with direct access to the outdoors. The classrooms and central gathering space can be combined in a variety of ways, facilitating multiage activities, performances, and community events. The site offers limitless potential for outdoor learning on more than 30 acres of wooded land and includes two bioswales to collect and filter surface runoff. The new facility incorporates a super-insulated, air-sealed passive house building shell with R-50 walls, an R-100 roof, and triple-glazed windows—investments that were fully offset by consequent reductions in the size and complexity of the building’s mechanical systems. Electric heat pumps provide supplemental heating, while a fully integrated heat-recovery ventilation system ensures a continuous supply of tempered fresh air. Annual heating costs are approximately $500, compared with $8,600 at the school’s previous location. 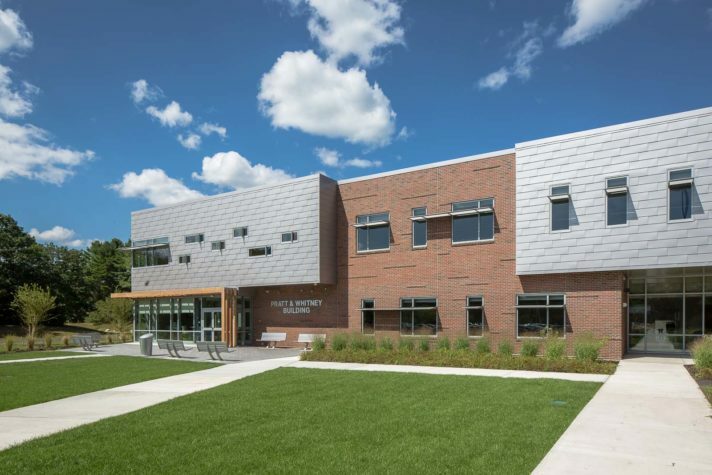 Completed in 2017, the Alfred Osher Jewish Community Alliance Campus (JCA) offers a vibrant gateway to Jewish life in southern Maine. The 19,000-square-foot facility was designed to accommodate a wide variety of community programming for all ages, including the Morris A. and Bertha Levine Portland Jewish Community Center and an education wing that is home to Adult Jewish Learning, the Goldman Family Preschool, and after-school and evening educational opportunities. The center is situated on a compact 2.2-acre urban site and is maximized for public access, solar efficiencies, and sensitivity to neighbors; it accommodates 50 parking spaces and a natural play, outdoor event, and recreation space. The architecture is based on the Hebrew notion of tikkun olam, or “rebuilding the world,” which translates here into themes of community, enlightenment, and equality. In material expression, enlightenment is expressed in the vertical; community in the interlocking circles; and equality in the horizontal. The building massing is an expression of these three functions, acting both independently and as one. The exterior architecture features a mix of simple materials patterned to provide texture and scale and reinforce symbolic design references. A high-performance building envelope was designed and modeled for energy efficiency. Inside, abundant natural light is brought in through two skylights and large perimeter windows that allow light to penetrate deeply into the center of the facility. Wide and tall corridors lead to various rooms and to office, meeting, and support spaces within the center. The colorful, inviting interior design is soft and comfortable, with hardwood accents and paneling. Building systems were designed to exceed enhanced energy benchmarks, increase occupancy comfort, and control and reduce future costs. These improvements include LED lighting with daylight and occupancy controls, high-efficiency natural gas heat, and low-flow plumbing fixtures. 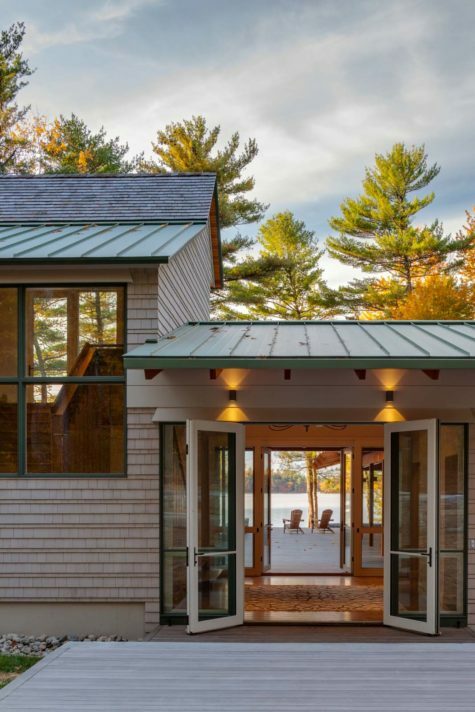 For this small summer camp on the shores of Alamoosook Lake, simple forms and durable materials, such as a standing-seam metal roof, cedar shingles with a 4-inch exposure, cement-fiber clapboards, and ipê decking, were combined to create a pair of clean, uncluttered buildings in the Maine woods. This large, three-sided screened porch is the place to be! As the ground slopes toward the lake, visitors feel as if they are in the trees, with commanding views to the water and to Great Pond Mountain beyond. 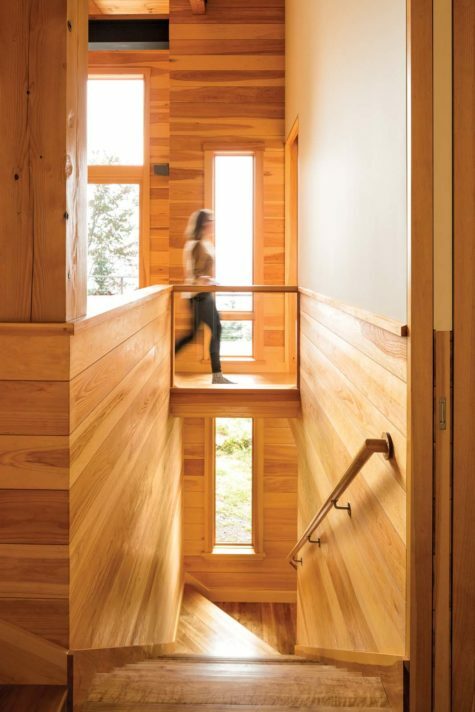 Douglas fir beams and western red cedar are combined for an inviting warmth. The 12-foot ceiling with transom screen panels affords a lofted feel and provides a vertical panorama of the water, trees, and sky. The lofted volume of the adjacent living room and kitchen grabs the same panorama. On the water side, all rooms open onto a 60-foot deck, making it a camp where the woods and the water are always in sight and just a few steps away. In spite of the building’s wooded location, building orientation and roof slope were optimized for summer sun angles. Thus, this small camp could be fitted with a solar PV array and modeled to be near net-zero energy. In their hometown of Norway, on a nine-and-a-half-acre lot at the top of Pikes Hill, the clients hoped to get distant mountain-peak views and a glimpse of Lake Pennesseewassee beyond. 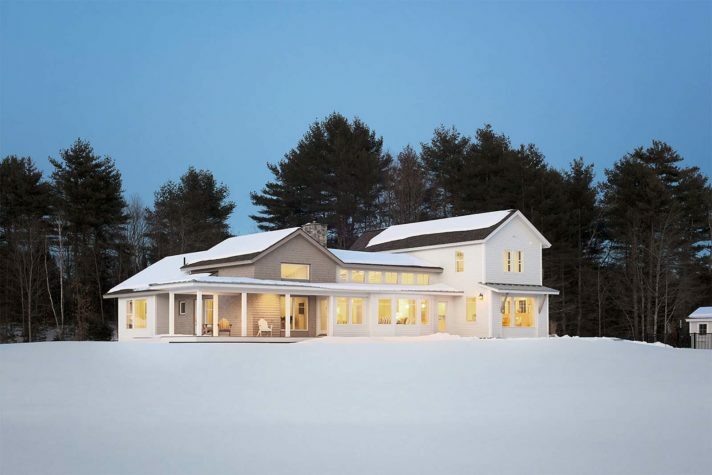 Most of all, the clients wanted a modest-sized home that would keep them warm in the coldest Maine winters—one with an indoor, endless pool where they can do their daily exercise. They also wanted a place to show off their prized collection of carved decoys. Kaplan Thompson created an almost crystalline form that reflects the push and pull of the most important factors on the site: views directly to the north/northwest, an approach from the east/southeast, and sun from the direct south. To keep the size modest, the architects peeled away excess space and scaled down any rooms that desired intimacy (bedrooms) or did not require height (the pool room). A deep but very thin overhang on the southern corner provides shade and drops a dramatic shadow that mimics the one seen at the entry porch. An incrementally tapered staircase carves away more space in the entry foyer and leads the eye toward the main living area. From the main living space, a ribbon of glass opens to the view down the hill and beyond to the lake. The exterior features locally milled tongue-and-groove cedar in two varying directions, with gaps not only at the verticals but at the horizontal joints as well. 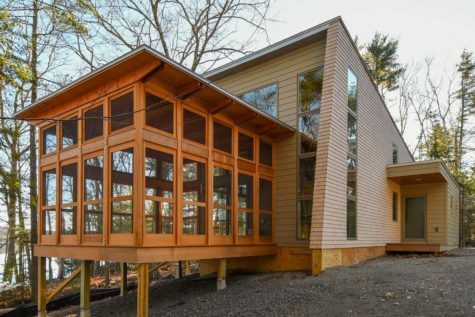 This high-performance home utilizes just a single heat pump on each floor. The gas stove operates only to take the edge off the coldest of nights—perhaps right after a dip in the pool. On the coast of Maine, a property developed prior to the enactment of the shoreland zone law often offers many advantages; Umami Point is one of those properties. Developed in the 1930s, the land had three small buildings: a main cottage, a photography studio, and an A-frame darkroom, all built on the water’s edge. Prior to purchasing the property, the clients contacted Knickerbocker Group to understand permitting complexities and renovation potential. Due to the shoreland zone challenges, the design team recommended planning board permitting prior to the real estate closing. Through a series of local zoning meetings, approval was obtained for renovating the three buildings in place, with conditions such as reuse of the existing building foundations. The next challenge was integrating the clients’ needs and how they interact with the landscape and built environment, both physically and emotionally, into the reimagined structures that were strictly limited by their existing footprints and area/volume restraints. To achieve this, the Knickerbocker team envisioned each building with its own unique purpose and function, much like the original cottages. The main cottage is the homeowners’ dream space: casually elegant with a playful yet contemporary aesthetic. Upstairs, the owners’ suite is bright and airy with wide openings from room to room, interesting angles, and elevated ceilings that offer no hint of the underlying spatial restraints. This same generosity of space and light is achieved downstairs, with a central kitchen that overlooks an open living and dining area encircled with ocean views. The former A-frame is now the guest cottage: a charming, private space with a deck overlooking the lobster boats working the bay’s waters. The Captain’s Quarters is a modest retreat—occasionally a studio but more often simply a quiet spot to relax at the end of the day and listen to the sounds of the bay. 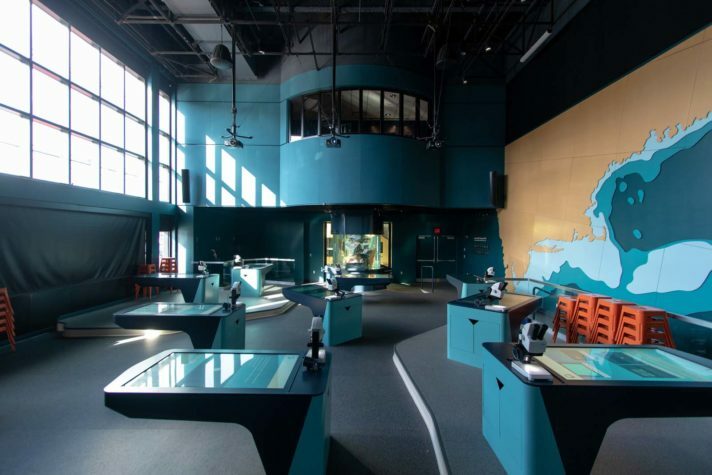 For over a decade, the Gulf of Maine Research Institute (GMRI) has pro- vided middle schoolers with a hands on, immersive science education experience through their LabVenture program. In 2018 GMRI’s Cohen Center reopened to support a new stream of NASA-funded content. The new lab includes tiered plat- forms with new “multitouch” tables that enable richer student collaboration by ensuring that every student can engage actively with the experience. 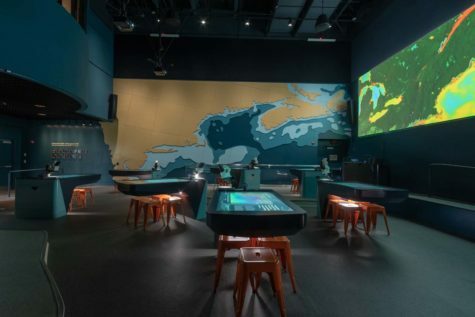 Behind the scenes, a completely renovated technical back end allows the LabVenture team to project NASA satellite data as well as local fishery data onto the tables and the projection wall. LabVenture exposes young Mainers to authentic science tools and methods of inquiry that are far beyond the reach of most classrooms. Students work in teams to gather evidence about the Gulf of Maine through hands-on and high-tech research. The guiding image for the physical renovation was a bathymetric map of the Gulf of Maine, reflected in a dimensional wall map. Fabricated by Art Guild, the map consists of three layers of medium-density fiberboard mounted on clips. Seams were specifically located to emphasize lines of latitude and longitude. Water depths of the Gulf of Maine are reflected conceptu- ally in the layered contour wall, as well as in the new multilevel floor system. The buildup of floor levels using cast-in-place concrete allowed the design flexibility to create organic shapes that mimic the Gulf of Maine and also permit- ted a multitude of electrical conduits to run to the multitouch tables throughout the space. 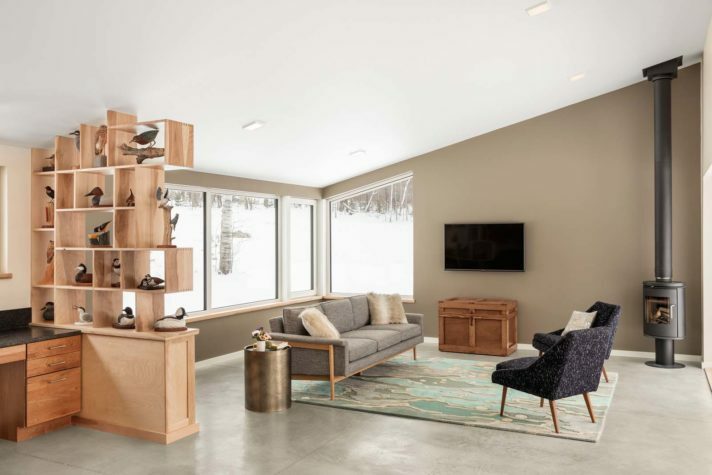 As the Maine-based partner Lassel Architects worked collaboratively with Open Studio Collective, the West Coast design studio responsible for the concept design, in selecting finishes and lighting that complement organic shapes, use, and durability. Other features of the renovation include custom multitouch tables, a wall-to-wall panorama projection screen, a renovated biodiversity tank, and new and repurposed light fixtures and acoustical treatments. 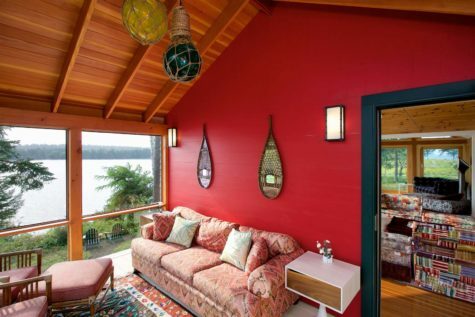 Through the thoughtful use of glass, natural light, and air, this turn-of-the-century classic camp has been reinvented into a bright and vibrant cottage, perched on the northeast corner of a peninsula in Friendship. This unique interpretation is the result of a close working relation- ship among architect, owner, and builder. 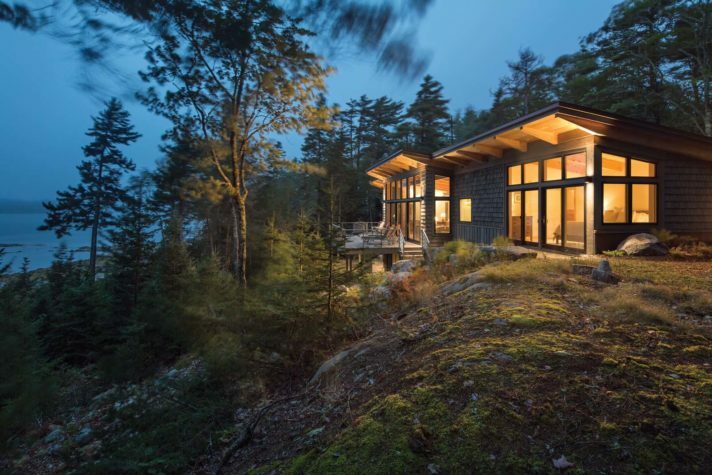 Challenged by zoning setbacks and deficiencies in the existing structure, the cottage was trans- formed through the addition of a breakfast alcove with stunning views to the north as well as a second floor with two additional bedrooms and a sitting room. Battered stone walls affix the house to the site, while the large openings connect interior spaces to the land scape and views beyond. Previously, where the gable end wall facing the ocean was mostly solid, the now full wall of glass takes advantage of the close proximity to the shoreline and gives the occupants the impression of floating on the water. The angular shape of the breakfast area extends from the house and is particularly suited for catching views of the east and sunrise. Generous corner windows in the second-floor bedrooms offer panoramic views of the water and of the rolling hills of the seaside farm to the south. 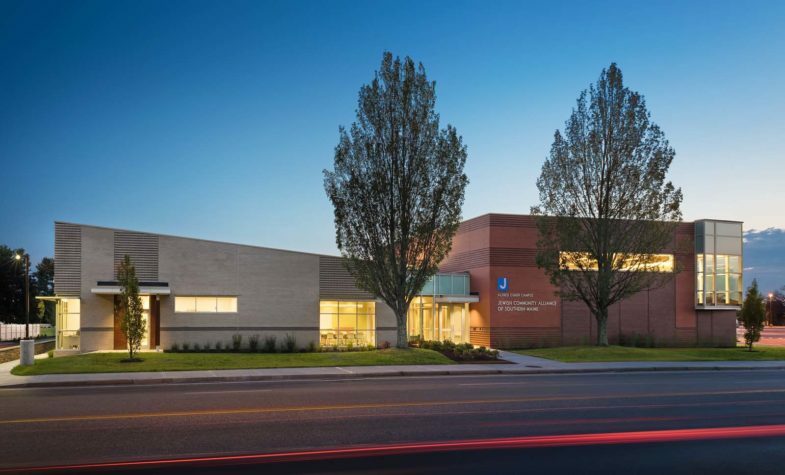 The Pratt and Whitney Building at York County Community College was designed to allow the college to expand their programs, accommodate more students, and provide modern, flexible spaces for learning. The building includes six standard classrooms, a learning lab, a combined lecture hall and flexible classroom, and various independent study spaces. Sustainable technologies were incorporated into the design. This project represents a step forward in the school’s overall master plan to develop facilities that accommodate the changing needs of community college students. The building is sited to take ad- vantage of views of the surrounding woods and to be accessed from the main entrance. The new building, along with the one existing building on-site, frames what will become a pedestrian-oriented space at the center of the cam- pus. In addition to the building, the design includes development of student parking areas, a pedestrian plaza, utility services, and off-site traffic-related improvements. On the quad side, the building facade is stepped to highlight the interior hierarchies. Exterior building materials overlap each other to create a sense of movement and activity. Red brick is used to draw a connection to the existing building, while metal panel shingles in a running bond pattern provide contrast. Staggered fenestration is an informal counterpoint to the more classic existing building, which allows the existing building to reference familiar symbols of academia while the new building captures the spirit of innovation and progress. 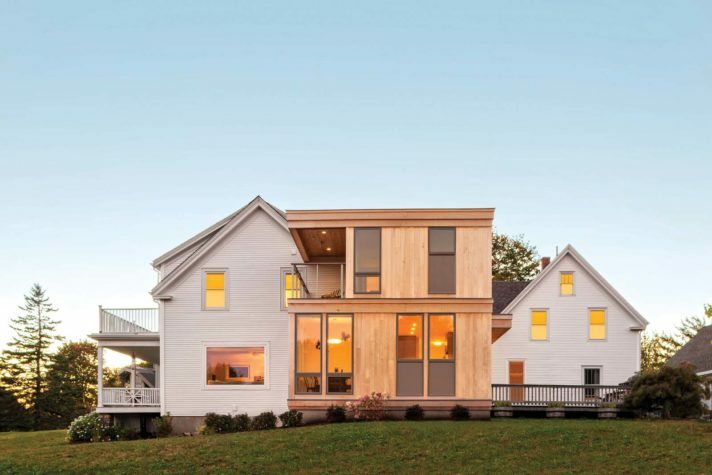 Two existing, traditional white clapboard houses were connected with a distinctly fresh, contemporary addition of about 1,500 square feet. 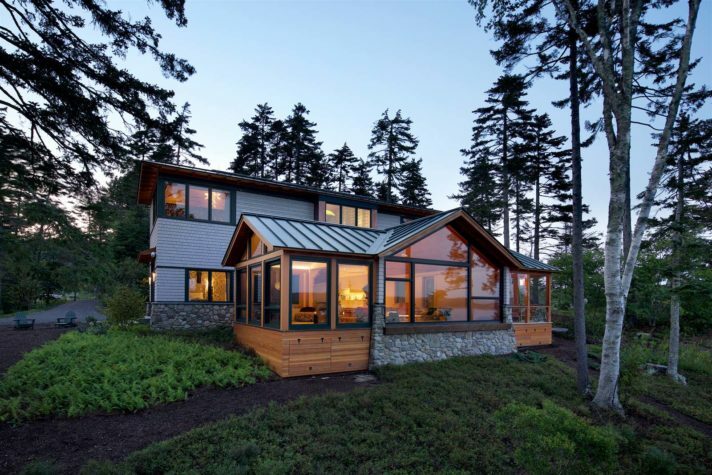 The two-story addition clad in eastern white cedar was positioned to afford outstanding ocean views and to create ample gallery and hanging space for the owners’ art collection. The addition includes a kitchen, dining room, gallery, office for two, and owners’ bedroom suite with a private covered balcony. A particularly creative challenge was posed by the disparate wishes of the homeowners—he wanted “all walls” for art display and exceptional gallery-quality directional lighting, and she wanted “all glass” for ocean views and natural light. The solution lay in designing floor-to-ceiling glazed assemblies at the corners of rooms and leaving clear wall expanses for their varied and extensive art collection. As one of the most used areas, the kitchen–breakfast space was positioned for the best views and proximity to an adjacent dining deck. Here, the owners can enjoy views of their yard, the ocean, and an adjoining nature preserve. The new kitchen offers copious amounts of storage in the pale gray stained cherry cabinets that pair well with the granite countertops. The owners have an extensive glass- ware collection, and the long kitchen island was designed for display and accessibility. As an intentional counterpoint to the original two buildings, the addition will age to a silvery gray over time. 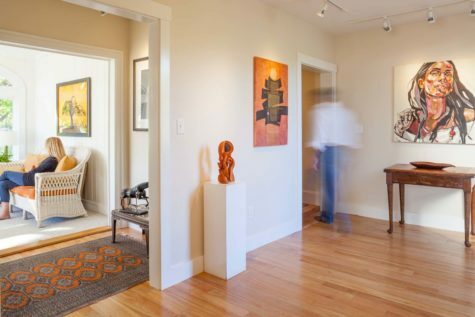 Now there’s plenty of space for the owners and their artwork; room for their ex- tended family, friends, and guests; and a place to cook and entertain. 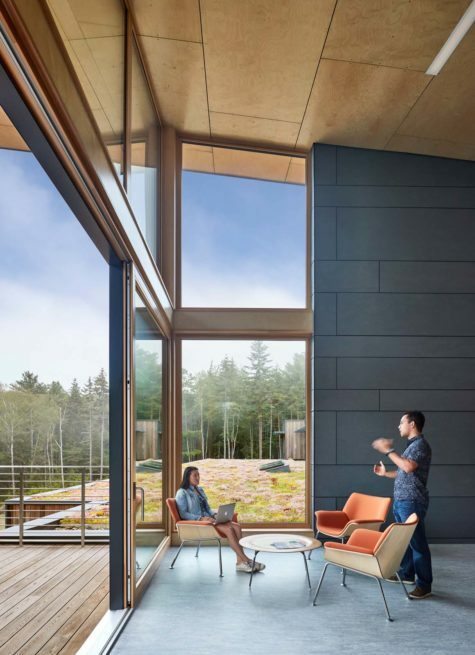 Located in midcoast Maine on a steep hillside above the Damariscotta River, Graham Shimmield Residence Hall supports the Bigelow Laboratory for Ocean Sciences’ educational mission by providing living facilities for college students and visiting scientists. After originally envisioning a dormitory on the top of the hill with visiting scientist cottages down by the water, the design team combined the students and scientists in one shared facility midway between the labs and water- front. The residence hall is designed so students and scientists can live and learn together, sharing meals, ideas, and recreation. The 15,300-square-foot residence hall has 32 student beds arranged in quads, three studio apartments, and one two-bedroom apartment for visiting scientists. In addition to dorm rooms, the building has a large community kitchen and dining room, a lounge space, a recreation and meeting room, a fitness space, and a large outdoor terrace. Passive house standards were the basis of design for building performance—the building boasts R-values of 43 in the wall assembly and 61 in the roof assembly. A remote, 85-kilo-watt solar array offsets more than the electrical operating costs, making this a net-positive building. The intent of the design was to weave in the landscape and context that is unique to Boothbay and the site itself. Using form, transparency, and landscape, the design blurs the boundaries of inside/outside and site/building. A strong sense of community is fostered in the design, with a focus on the shared spaces rather than the personal spaces. Completed in July 2018, this camp was designed by Whitten Architects for a Boston-based professional couple with a young family. The new home is a four-season retreat in the Lakes region on the site of an old girls’ summer camp. 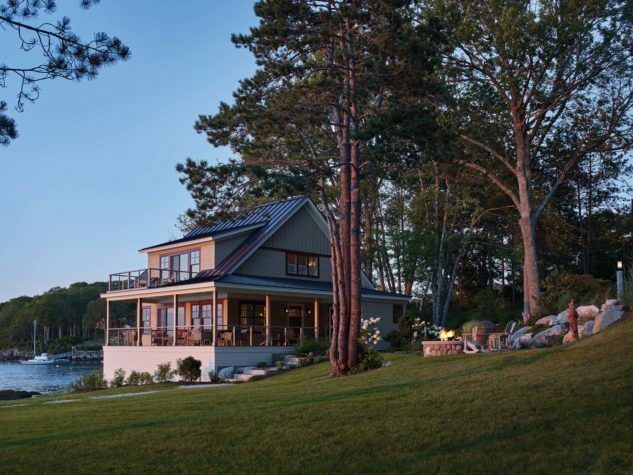 The homeowners were actively involved in the design process, drawing inspiration from turn-of-the-century waterfront camps and their own Maine roots. The home features an exposed timber frame; wood floors, walls, and ceiling; and a fieldstone chimney and fieldstone terrace walls. Hand-split granite was salvaged from the site and repurposed as part of an entry bench, a fireplace hearth, and a bench on the screened porch. Upon one’s entering the property between stone piers, an alley of 70-year-old white pines comes into view and leads the way to the water- front site. 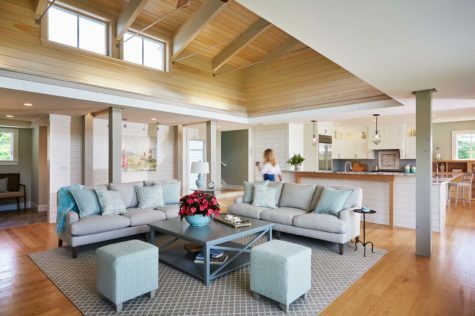 The family wanted to create an indoor living space with a direct connection to the outdoor living spaces, which include the screened porch, a terrace with a fire pit, a wrapped porch, and dock with access to the lake. The first floor is an open-plan living and dining space designed to invite spaciousness and light. 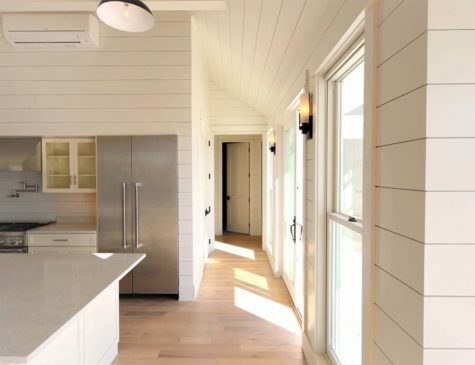 A generous kitchen has a butcher-block island and bi- parting sliders that open to the front porch toward the lake. Other living spaces on the first floor include a full pantry, mudroom, half bath, laundry room, and getaway space with an office and TV. An open staircase to the second floor features a generous landing as a play space before leading up to the owners’ suite, two guest bedrooms, a bunk room for five, and a large “Jack and Jill” bath. 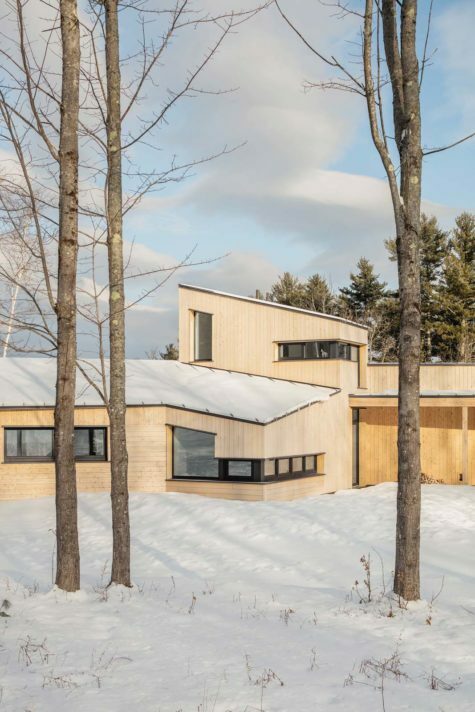 The house features high-performance systems with a modern floor plan, radiant first-floor heating, and a multizone heat pump for heating and cooling in all seasons. 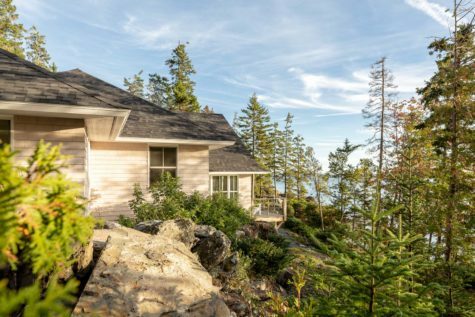 Exterior finishes include stained white cedar shingles, stained red cedar novelty siding, a metal roof, and screened and wrapped porches with exposed Douglas fir rafters. Grown from the site—that was the primary directive for this year-round retreat on Northeast Harbor on Mount Desert Island. The spectacular site of spruce and ledges has southwesterly views as it rolls down to Somes Sound. The building’s form nestles into the hillside on the high side and flies as the site drops away, enabling a daylit lower level. While a driving objective was cost effectiveness, the architects integrated the use of quality, low-maintenance materials for a timeless feel. The result was a simple form, essentially a rectangle, with a single mono-pitch shed roof that opens up and out to the light and views. It is sheathed in copper—a simple gesture with quality material. The exterior siding is hand-split western red cedar shakes with stained red cedar trim. Winkelman worked with Marvin Integrity windows to stay on budget. The five-bedroom program was split, with two bedrooms pushed to either end (and one in the daylit lower level), framing the public spaces (entry/living/dining/kitchen) in the middle and maximizing light and views. The entry sequence begins high, looking over the copper roof toward the water. As one enters the building, there is a layered view through the interior to the water. The building steps down as it flows with the contours of the site. This enables the uppermost bedroom to exit to grade, onto the ledges. As the building raises up, the center living/dining room drops to have generous vaulted ceilings and a deck that extends toward the water. The building continues to step down and into the daylit lower level at the low point. Granite steps continue to follow the grade down to the shore.